Conservation Photography is a new part of photography, aimed at nature conservation initiatives. The contribution of photography in conservation is making pictures useful in scientific research, environmental documentation, or activities to raise consciousness on priority ecological themes. 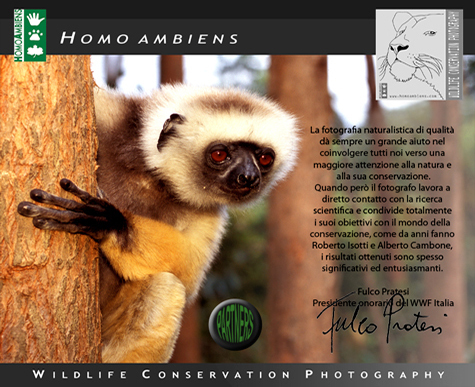 Alberto Cambone and Roberto Isotti, photographers and founders of Homo ambiens, have been actively engaged for many years in Conservation Photography, even before its public recognition. Our works are often taken with the help of NGO, local Organizations or Foundations that protect natural area. We create personal and self-initiated photography and multimedia projects. We collaborate with publishers, NGO, foundations and Parks management offices to tell the natural world in an innovative, original, ethic way. We trust that photography can help actively to increase global sensitive towards biodiversity, habitat preservation issues, for a new relationship between men and nature. Homo ambiens is an initiative based in Rome which aims through photography to share the beauty of Nature and explore how the environmental complexity regulates life on Earth. We pursue the human guest to live in harmony with the natural environment. Founded in 1993, Homo ambiens shows a photographic panorama of the state of our planet. After Homo abilis who was able to make the first instruments, Homo erectus who had the ability to move on back art and Homo sapiens who slowly reaches conscious of the surrounding world, finally Homo ambiens should be able to go back to be part of nature and live in harmony with his ambient, without give up improvements guaranteed by technology progress and the advantages of evolution. Photographers and naturalists, Alberto Cambone and Roberto Isotti travel all over the world, reporting the beauty and fragility of the last natural paradises. Since few years Mic�l Ricci has joined the staff, to enrich the group with fresh storytelling and editorial creativity skill. Our big passion for nature gets us to spend countless hours on the field to take the natural world in all his beauty and complexity. Their archive counts more than 200.000 images and 10.000 videos; in 30 years of work a documentation of great creative and scientific value, rich in variety and originality has been collected.